On Tuesday, February 5, 2019 at approximately 9:00 PM, an armed robbery occurred at the Rock Springs Deli, 1320 Rock Springs Road, Rising Sun, Maryland. 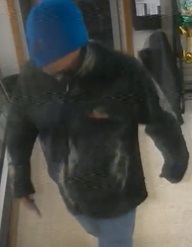 A white male, approximately 5’8” -5’10” tall, medium build, with a blue winter hat with eye holes pulled over his face, a multi-cam jacket, with some facial hair on his chin, entered the store and brandished a knife, demanding money. He seized an undisclosed amount of US currency and fled on foot to an unknown location.